It was frosty here this weekend, so I got to thinking - is there any connection between the homographs קרח kerach - "ice" and kereach - "bald"? As far as kerach ("ice"), a footnote in the Ben Yehuda dictionary points out that the Syriac cognate primarily means "storm", and speculates that this might be a connection between the two meanings: a storm can tear the leaves off of trees (making them bald), and a storm can bring with it cold and snow. Another theory is proposed by Gesenius, that the common root means "to make smooth", which applies both to ice and to a bald head. That might be a simpler suggestion, but his book was written in 1836, with far less exposure to research into related Semitic languages. So perhaps the evidence here leads to a more complicated conclusion. What about the name Korach קורח, found first among the sons and leaders of Esav (Bereshit 36:5, 36:16) and most famously the Levite who led the rebellion against Moshe. 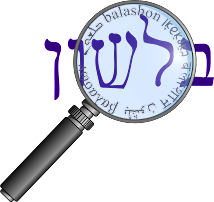 \Daat Mikra (Bereshit 36:5) says that it probably means a bald man (which stands in contrast to the "hairy" name of Seir - also found in Esav's family).